Long ago in a galaxy far away….. The Clone Wars have been waging for years as the forces of Dark and Light battle to vanquish each other once and for all. Intrigue is deep as Chancellor Palpatine (aka Darth Sidious, Dark Lord of the Sith) vies for control of the Republic. The Jedi Council, while unaware of Palpatine’s secret identity, are still suspicious of his motivations and work to expose his true plans. Meanwhile a powerful young man, Anakin Skywalker, has been exhibiting strong Force powers, but is plagued with his own internal struggles. Both the Jedi Council and the Sith have their eyes on him, and both factions are working hard to bring him further into their fold and gain his full loyalty. Will the Jedi Knights uncover the dark ambitions of Chancellor Palpatine? Or will Darth Sidious take control of the Republic and destroy the Jedi once and for all? Will Anakin Join forces with the Sith? Or will he find the Light and bring unity to the Jedi as they lead the Republic down the path of good for all? 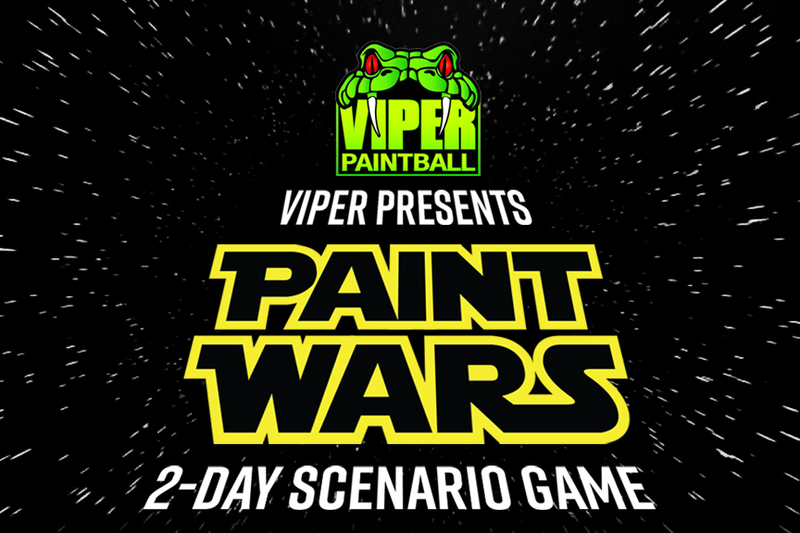 YOU will decide if you join us at world-famous EMR Event Park for Paint Wars II: Vengeance of the Sith! MAMBA (DARTH SIDEOUS) is back leading the DARK SIDE with his XO ERIC ENGLER who has come over to the Dark Side. JOHN ROMANO (OBI-WAN KENOBI) will be joined by his XO BARNEY who came over from the Darkness to fight for the Universe and Good. PLUS Saturday Evening the PAAARRTY will be Produced by ANDY POTTER of VALKEN. Tour the INFAMOUS BUNKHOUSE ROW with BLUE and the BLUE’S CREW Gang. EARLYBIRD ENTRY If Pre-Regged by 8/18/19, is $50 and includes the entire Weekend of Light Saber Fighting, Unlimited Compressed Air or Maximum of two CO2 Fills per Hour per Person, or the Standard Rental Package consisting of a TIPPMANN Semi-Auto Marker, Goggles, C/A Bottle, and unlimited C/A. PLUS YOU GO INTO an EXCLUSIVE DRAWING for a NEW MARKER! ENTRY If Pre-Regged by 9/8/19, is $50 and includes the entire Weekend of Light Saber Fighting, Unlimited Compressed Air or Maximum of two CO2 Fills per Hour per Person, or the Standard Rental Package consisting of a TIPPMANN Semi-Auto Marker, Goggles, C/A Bottle, and unlimited C/A. HERO ENTRY DISCOUNT If Pre-Regged by 9/8/19, is 25% OFF for All Active and Veteran Military, Police, and Fire Fighters from the US and Canada. Must Show Valid Hero ID when Checking In. ONLY PLAYERS THAT PREREG BY 9/8/19 CAN REQUEST A SPECIFIC SIDE. After 9/8/19, players will be assigned to the side that EMR determines to balance the teams. VALKEN PAINTBALLS If Pre-Paid by 9/8/19, are $65 per Case of 2000 and $20 per Bag of 500. SPORTS SMOKE If Pre-Paid by 9/8/19, is at the Discounted Price of $10.00 ea or 6 for $58 for the Tactical Smoke Grenades (TSG) and $21 ea or 6 for $120 for the Battlefield Smoke Grenade (BFG). RENTAL UPGRADE If Pre-Paid by 9/8/19, is $20 for an Eclipse Etha, Electronic Hopper, and 3000 PSI HP Tank. Limited Quantities! AFTER 9/8/19 UNTIL 9/15/19, Entry is then $55, Case of Paint $70, Bag of Paint $22.50, and Sports Smoke & Rental Upgrade Purchases are Only Available at the Event. ENTRY AT THE EVENT is $60, Case of Paint $75, Bag of Paint $25, Sports Smoke TSG $11, Sports Smoke BFG $22, and a Rental Upgrade is $25 as available. BUNKHOUSE Lodging costs $10 Per Person to stay in for the Entire Event if Paid For by 9/8/19 and should be reserved in advance with Pre-Registration to guarantee a spot. After 9/8/19 through 9/15/18, each bunkhouse spot is $15. To reserve Your Own Private Bunkhouse, the cost is $100 for the Entire Event if Paid For by 9/8/19 plus a Refundable $50 Deposit and should be reserved in advance with Pre-Registration to guarantee a Private Bunkhouse. After 9/8/19 through 9/15/18, it is $125 plus $50 Deposit. 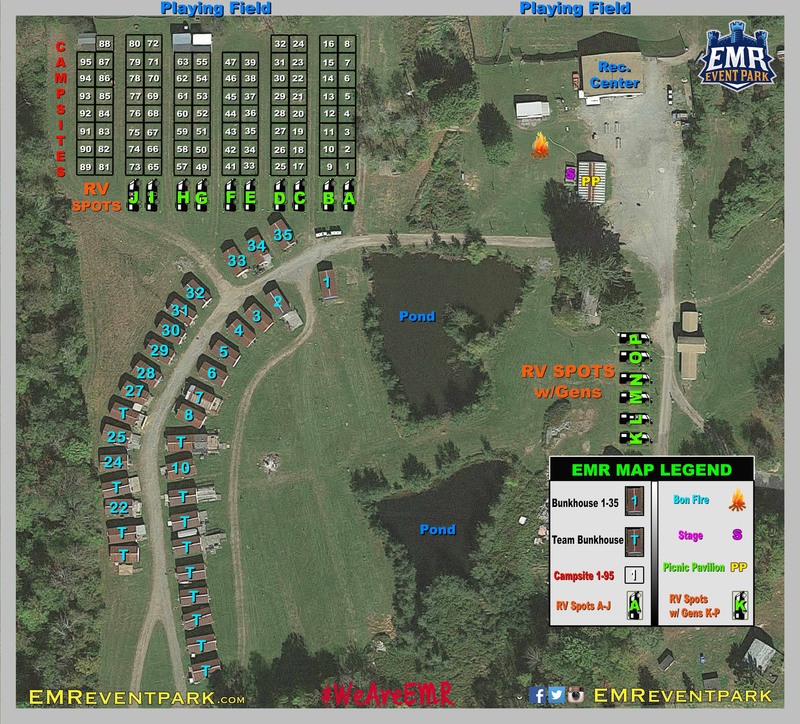 CAMPSITES for Tents and Campers are 20’ x 20’ and Cost $10 Per Campsite for the Entire Event if Paid For by 9/8/19. More than one site may be reserved at $10 Per Site. After 9/8/19 through 9/15/19, Each Site is $15. RV SITES are 20’ x 40’ and Cost $20 Per Site if Paid For by 9/8/19, however there are no water or electric hook-ups for the RVs. You must notify us if you wish to run a Generator past Midnight and if so, you will be assigned a spot apart from the Campgrounds. Walk-on players are not guaranteed Campsites or RV Sites. After 9/8/19 through 9/15/18, RV Sites are $30 Each. Game FPS is 275 fps. No Dead Man Walks are allowed in this game. No Barrel Tags are allowed in this game. No assassins allowed to be used on the other team. No directly shooting through a crack or opening in the walls less than 4” wide unless you are at least 5’ from the opening. Splatter does not count by paintballs. Grenade hits must amount to more than an accumulation of a quarter coin size. ONLY SPORT SMOKE is allowed to be used at EMR and cannot be thrown inside or within 20’ of the Castle Walls. Your signature on the check in sheet acknowledges that you know, and understand, the rules contained herein. It is important for reasons of your own safety and enjoyment, as well as that of your fellow players, that you know these rules and abide by them. No non-event paint allowed. Use of unapproved paint on the field is grounds for immediate ejection from the property with no refund. Pets: No pets are allowed due to the fact that no insurance company covers the liability. Although we are sure you have “the nicest puppy in the world” we cannot risk our business and livelihood for your dog, nor can EMR. Alcohol: Adults of legal drinking age are allowed to consume alcoholic beverages up to 2am Saturday. At that point consumption of alcohol is prohibited until after the end of play Saturday afternoon. All cans or bottles must be in a “Koozie” or other container cover. This is solely in the interest of not flaunting the consumption of alcohol in pictures or to patrons. Any consumption of alcohol by anyone in attendance (playing or not) between 2am Sunday and 2pm Sunday will be considered grounds for immediate ejection from the property with no refund. Any consumption of alcohol by minors, or providing alcohol to minors, will be grounds for immediate ejection from the property with no refund, and the local authorities will be alerted. Player packet: When you check in you will receive a packet with a player ID card (tells about the character you are playing) and a Player Badge. DO NOT LOSE EITHER OF THESE. They will not be replaced for any reason, and you cannot play without them! If you find one you must turn it in at Central Command immediately. Use of an enemy ID card to gain access to the enemy HQ, or acquire armband tape, is strictly prohibited. This includes one that has been falsified, lost, misplaced, or given to you freely. The only exception would be a “spy” designated by the event director. Armband Tape: This will be provided by your commander or one of his officers, not by the event staff. You may also use alternatives such as Team Tags armbands, but ONLY for your side’s color. Players using Team Tags or anything else to pass themselves off as members of the other side will be reprimanded. We ask that the commanders tape both arms with their team color so as to allow their own players to identify them. You may VERBALLY misrepresent your team affiliation. After all this is a roleplaying game. You are not required to wear your team color armband tape. The team color is not intended to show you whom to shoot; it is designed to assist your teammates in knowing whom not to shoot! Intentionally providing armband tape to the enemy for malicious purposes is prohibited. Players may not use anything to mimic enemy tape such as “Team Tags,” bandanas, etc. Medics are required to wear a white armband on each bicep. Acquiring Enemy Armband Tape: The only legal way to acquire armband tape is from a legal member of that team that was placed on that side by the event staff. The ONLY acceptable armband in this case is the colored duct tape provided to each side by the event staff. Using Team Tags or other armbands for this purpose is expressly prohibited. It is legal to verbally mislead the enemy to gain armband tape. Intentionally providing armband tape to the enemy for malicious purposes is prohibited. If you manage to legally acquire enemy armband tape you must still insert at your own hospital. Anyone who legally acquires enemy armband tape must report to the scenario director, in person, as quickly as possible for a special briefing. Markers: Any commercially produced, commonly available .68 caliber paintball marker may be used. Any marker that can be adjusted on the field, without tools, is required to have a locking device to prevent this from being possible. During daytime segments non-assisted pump markers may chrono up to 300 feet per second, while all others are limited to 280 feet per second. During nighttime segments all markers must be set below 250 feet per second. No mode is allowed that yields more than two shots from the first two trigger cycles. All electronic markers must be capped at 13 balls per second IN ALL MODES INCLUDING SEMI-AUTO MODE. You must also have a “barrel sock” for covering the end of your barrel in all non-play areas. Barrel plugs are not acceptable with the exception of the orange Tippmann pistol plug with attached bungee. Players caught with no barrel sock on their barrel in an off-field area other than the chrono may be ejected from the event with no refund. This includes markers with no paint or air. If it has a barrel it is required to have a barrel sock on it. Period. Players using pistols only, or carrying only a barrel, must have a barrel sock to cover the muzzle to indicate they are an eliminated player. LAW Rockets (Rocket Launchers): We do not allow the use of “sabot” rounds (wads of paintballs) or grenades as projectiles from launchers. You must use Nerf brand “Mini Vortex,” JCS “F-69,” or Kush Nation Armory foam rockets. The only modification to these that will be allowed is trimming of no more than 1⁄2 inch off of each of the three tail fins. All launchers must be chronoed at less than 140 feet per second. These devices are for hard targets only such as helicopters, vehicles, buildings, bunkers, bridges, etc. They will eliminate vehicles, but will not destroy a building or bunker. These devices may be used during daytime segments only. You must have a “Heavy Weapons Specialist” card to use a LAW on the field, and all launchers must be approved before use. Each “Heavy Weapons Specialist” may only insert from the hospital with eight rockets, and may only carry eight with them on the field. Only Heavy Weapons Specialists may carry rockets. Once a rocket has been fired it cannot be retrieved on the field. Fired rockets can be reclaimed at Viper Command. Goggles: Goggles must meet ASTM and insurance requirements, must be unaltered, must provide full face, eye, and ear protection, and must have suitable, uncracked and undamaged lenses in them. Players caught lifting their goggles, or breaking the seal of the goggles against their face, may be ejected with no refund. Be smart! Be SAFE! Radios and cell phones: Radios are allowed and encouraged. You may monitor any frequency you wish. Players may use their radios or cell phones anytime except while on the field but out of play. Once in the hospital or off-field they may communicate at will. Players will not be allowed to stand off-field and gather reconnaissance of the enemy base or for recon and report missions. Prohibited equipment: No aerial drones or other remote control devices allowed without express permission, in advance, from Viper Paintball. No tools or knives may be carried on the field. No personal fill stations allowed on the premises. Any items found in violation will be confiscated and may, or may not, be returned after the event. No unbreakable trip wires. No pyrotechnic devices. No unapproved smoke devices. NO METAL CLEATS! Judge number and see the Ultimate Judge or event director. Player Refs: There a number of experienced scenario players who serve as “Player Refs”, our version of undercover cops. They are constantly watching for cheaters and unsafe players. They can also be helpful for answering questions if you cannot find a field referee. However, they are prohibited from signing off on any mission cards. Non players on the field: If you wish to enter the field to take photos, retrieve a lost item, or any other reason you must check with the scenario director before doing so. Wildlife: Shooting of any wildlife will not be tolerated. If you accidentally do so please notify the nearest referee immediately so that we can make sure the animal is okay, or render assistance if necessary. If you witness someone doing so please notify the nearest ref immediately. Confrontations: ANY player who makes confrontational remarks such as “Come do something about it” or related invitations will have their player badge confiscated by the nearest referee. ANY player who advances on a player making such an invitation to them will ALSO have their player badge confiscated by the nearest referee. These players may come to Viper Central Command to inquire as to whether their badges will be returned to them or whether they will be ejected from the event. Eliminations: If you are marked by a direct hit from a paintball (even if the ball itself ricocheted) and it breaks on you and leaves a quarter-sized mark, you are eliminated. During the nighttime segment (immediately following dinner break) all hits count whether they break or not. If you are wearing a “ghillie suit” all hits count on areas covered by this material. Once eliminated you must immediately exit the field or report to your “hospital.” You must take the shortest reasonable path to do so. Using your “dead time” on the field to do reconnaissance will result in a judge punch on your player badge. * It is important that you “get up and out” as soon as you are eliminated. Hold your marker high above your head and run out of the bunker! With the large number of players you will encounter it is hard to hear someone shouting “Hit!” while he/she searches for their barrel sock, and players will continue to shoot thinking you are still in. “Get up and out” and get away from the lines of fire, then search for your barrel sock! Faking injuries or medical issues: This will not be tolerated for any reason. Using such ploys on the field will result in ejection from the event. Surrenders: We request, whenever possible, that you request players within 20 feet to surrender. This is not a hard and fast rule, but a strongly suggested guideline. We also recommend that players who are given this option accept it graciously. The player who asked was displaying good sportsmanship. Please don’t reward them with a close shot. Thank them for not shooting you at close range and report to your hospital. Grenades: Grenades may be used during daytime segments only. In order to be considered an elimination there must be enough paint on the player to be collected into a mark the size of a quarter. One or two specks will not be counted as an elimination. Game Start: When the game begins your commander will already know what the first missions for each segment are. Be sure that you are at your base and ready to go when each segment begins! For the first thirty minutes of each segment players who have not yet been in play may enter directly to their base. Once you are hit you must wait for the next insertion window to open. Reinsertions: Players may only enter the game from their own hospital. Even if you are able to get the other side to tape you with their armband tape you are still not a member of their side, and must use your own “hospital.” Reinsertions happen every twenty minutes, and the window for inserting stays open for ten minutes. This means that if you show up at the “hospital” at 2:58 you can reinsert at 3:00, but if you show up at 3:02 you may tag up, wipe off your old hit, and go right back to your base. When you insert you must go to within 20 feet of your base before you may remove your barrel cover and enter play. The exception to this is a “Hot Insertion.” If the opposing team has control of your base (the referee will make this judgment) you will be informed at your hospital that it will be a “Hot Insertion” which means that you are in immediately when the hospital opens. This time should be used to take out as many of the occupying forces as possible since you only have to tag up at your hospital when you get hit, as opposed to them having to go all the way back to their end of the field. Command bunker and base: There is no shooting into, or out of, the command bunker. To eliminate everyone in the command bunker you need only to stick your foot inside the first doorway and announce “All DEAD!” At that point the base referee will clear out everyone in the bunker. The bunker is not destroyed, but everyone inside will be eliminated. No markers are allowed inside the command bunker except for the commander’s. No props are allowed to be kept in the command bunker. Physically blocking the door with objects or persons is prohibited. Bunkers on the field: No player may move any bunkers unless specific provisions are outlined by the event director allowing him to do so. Boundary tape: Unless there is a safety issue (such as near the staging or camping areas, you are permitted to shoot over the tapeline as long as you are on the field and shooting at live players. “Dead man walks”: This term is a misnomer. If you hold your hand, or marker, above your shoulder, or place your barrel sock on the end of your barrel, you must either call for a medic or leave the field. However, if you choose to undertake a “CASUAL STROLL” by simply pointing your marker at the ground and assuming a casual, relaxed posture and walking down-field this is perfectly legal, and it is up to your opponents to discern whether you are a threat or not. Props: Props are items in the game that can be used to perform actions that will help you achieve victory, or they may actually be worth points toward your score. Props must remain in play once they are taken on the field. That means if a player is eliminated, and he may drop it for another player, or it must be back on the field within thirty minutes. If this is abused and used as a tactic to maintain the prop by keeping it off field more than on a penalty will be assessed. Props cannot be stored in the command bunker. However, if not being carried on a player’s person they must be kept within 60 feet of the command bunker. They cannot be “buried” in the back corner of the field. These rules are meant to keep the props in play, adding to the excitement of the game. Anything considered for score must be turned in before end of play. Search the Body! : If someone has just been eliminated, or is waiting on a medic, a “live” player may shout “Search the body!” at which point the marked player cannot move for thirty seconds. The live player will have that much time to get to them and demand any props or documents they may be carrying. If you are the player being searched you must immediately surrender any such items. This can only be done once, and only at the point the player was eliminated. If one of their own players gets to him first he may take possession of the props before you get there. A judge may override your “Search the body” call if it is apparent that you cannot get there in time, and are just trying to stall the action. Mission cards and supply cards are considered “props.” However, MOS cards (the card that identifies a player as a medic, sniper, engineer, etc) are not. Helicopters: Basically a silhouette on a pole, this represents players who are airborne in a transport chopper. The “pilot” must have credentials and wear a helo vest. The helicopter pole is inserted into a sleeve in the back of the vest so that it can be seen over their head. The helicopter can transport 5 passengers and a pilot. The pilot must have a judge initial and record your time of takeoff on a fuel card. Each flight lasts a maximum of thirty minutes. All flights should originate, and terminate, at your HQ. You refuel by landing at your HQ and having the judge initial another takeoff. If you are about to run out of fuel in the field you may land and have fuel delivered to your aircraft. You may then take off again. Helicopters may not drop ordnance. This includes, but is not limited to, smoke grenades, paint grenades, and satchel charges. You may complete a “photo recon” or “recon & report” mission while airborne. No one may fire at ground targets while riding. Passengers MAY fire at other aircraft’s passengers and pilots while in flight. If a passenger is hit in this way he is eliminated. If the PILOT is hit the aircraft crashes. The pilot lands by dropping to one knee, at which time all passengers may disembark and find cover. The pilot and passengers may fire at ground targets only after the pilot lands, and you must wait five seconds (one thousand one, one thousand two, etc) before doing so. Anytime you land you must wait ten seconds before taking off again. Any player can eliminate a helicopter itself by firing a Nerf rocket so that it breaks through their group. You do not need to hit a player or the pole. If the helicopter is shot down or crashes you must turn in the silhouette to a judge. Your commander may have an opportunity to purchase a new one. Tanks: Any motorized vehicle must carry its own liability insurance, and list the host field and Kerry Rosenberry as “additional insured.” All drivers must have a current, valid driver’s license. The vehicle is limited to fast walking speed. It must have a clearly visible way for players to discern what color the tank is allied with, and it must have a white flag that can be hoisted if it is eliminated. All vehicles must have a full inspection by the ultimate judge at the event prior to being allowed on the field. The tank will receive its own badge with places for judge punches. Three rule violations will result in its permanent removal from the field. Any air source inside the vehicle that is not attached to a marker or launcher must be securely anchored and the valve must be protected. Tanks must have an audible 12 volt horn that is not overly loud, but can be heard 150 feet in any direction. For safety reasons this may not be a handheld air horn as these are reserved for emergencies. One long blast means the engine is off and players may use it as a bunker. Two blasts mean that the engine will start in five seconds and all players must move away from the tank. All tanks must be cleared with the event director no less than three weeks prior to the event or they will not be allowed on the field. No exceptions! Vehicles must remain at least 300 feet from the enemy’s command bunker. If the driver is unable to see due to paint splatter their windshield must be cleaned immediately. You can eliminate a tank with a satchel charge or a LAW (Nerf launcher). Only “Nerf Mini Vortex,” “JCS F69,” or “Kush Nation” rounds may be used. The only modification to Nerfs that will be allowed is trimming of no more than 1⁄2 inch off of each of the three fins. Tanks may only carry twelve rockets. A tank may never have more than twelve rockets regardless of number of launchers or passengers. The first rocket hit will disable the tank, at which point they must turn off their motor. A second hit, in a row, will destroy it. An engineer can repair the initial rocket hit and nullify it. You can disable a tank (no movement, but it can still fire) for five minutes with a paint grenade. Players near a motorized tank may not get within 20 feet of the tank while the motor is running. Intentional violation of this by tanks or players will result in disciplinary action. Markers to be fired from the tank are limited to 260fps. An engineer can repair a grenade hit and nullify it. Vehicles are not to be used during the nighttime segment or the Final Battle. However, they may be parked near the HQ and used as a stationary bunker. They may re-enter play Sunday morning. “Walking tanks”: The 20 foot safety zone rule does not apply to walking tanks. All other tank rules apply. Human-powered tanks are requested to appear as much like a real vehicle as possible. Please build something more than just a box to throw over your head. These are also limited to fast walking speed just as a motorized one, and will be required to use the same major roads and paths as a motorized tank. All tanks must be cleared with the event director no less than three weeks prior to the event or they will not be allowed on the field. No exceptions! Demolitions: Any building, bridge, or bunker you see that has been wrapped in brightly colored one-inch tape has been destroyed. You may hide behind it or around it, but you may not enter the structure, or cross the bridge, until an engineer repairs it and removes the tape. You cannot” destroy” or “secure” a destroyed objective. Your commander will assign these roles. If he so chooses he may unassign a role and reassign it to another player by calling in to central command and requesting approval. You may only be assigned one MOS. Use of falsified MOS cards or supply cards, as well as ones from previous events, is strictly prohibited. Medic: Medics ARE required to wear a white armband on each bicep. If you intend to be a medic you must have a pen with you at all times! Medics can heal players who have not been barrel-tagged or blown up. They cannot “heal” head-shots. If you wish to be healed by a medic you must stop as close to where you were hit as possible and shout “Medic!” at which point the referee will give the medic a reasonable amount of time to reach you, wipe off your hit, and record you badge number on his “Medic Supplies Card.” You are not to be shot at once you call for a medic, nor can you verbally interact with players. The medic can be eliminated while in the process of completing his tasks. A player calling for a medic is not to be targeted by paintballs. If you can reach a player calling for a medic and barrel tag him he is eliminated and must leave the field. Demolitions Expert: Can use satchel charges to destroy bridges, bunkers, and buildings. Engineer: Can rebuild destroyed bridges, bunkers, and buildings, as well as repair tanks. Pilot: Pilots are the only people allowed to fly “helicopters” although anyone may be a passenger. Heavy Weapons Specialist: Cleared to carry Light Antitank Weapons. (LAWs) These can destroy helicopters and tanks, and eliminate players in buildings and other man-made structures. However, they will not destroy the structure, and cannot be used for missions requiring the simulated destruction of an objective. Only HWS players are allowed to carry rockets, and they may only insert with eight rockets. They can carry a maximum of eight rockets at any time while on the field. Sniper: Snipers can use “Sniper Shot” cards to eliminate any player in plain view within 300 feet. The “sniper” must surrender one “Sniper Shot” card to a judge in order to eliminate a player. Each “Sniper Shot” card allows you to eliminate one target. They do not need to actually fire their paintball marker to accomplish this elimination. “Sniper Shot” cards may be used by snipers to complete a “sniping” mission, but must take out a player at the objective to complete the mission. Snipers cannot target helos, or their passengers, while in flight, nor may they fire from helos. Only snipers may possess “sniper shot” cards, and are limited to carrying no more than five at a time. Snipers may not “snipe” from a helicopter, tank, or air insertion. Once the commander is given a mission it must be completed within the allotted time. Do not waste time! You cannot come back and do it later. The mission packet will contain a number of mission cards. The mission card can leave the field and return; however, it can also be taken in a “search the body.” The commander can direct players in the field to begin the mission. However, the mission cannot be confirmed or completed without the card being at the final mission objective. Once the mission is confirmed and completed the referee will radio in the mission as complete and keep the card. Once you complete your mission you should inform your commander IMMEDIATELY! The commander will also have a very limited number of blank “second chance” mission cards. In the event that a mission card becomes lost they can, then, fill the information in on a second chance card and attempt it again. The information must be exactly as it was on the original card, and it must be completed by the original deadline. It is prohibited to send two cards, simultaneously, on the same mission. Final Mission: The final mission of the game will be to hold a particular objective. Whoever has control of that objective at the end of the game will receive fifty points. Chono speed during this segment of the game is limited to 250 feet per second for all markers, and firing mode is limited to semi-auto only. Grenades, helicopters, Tanks, and Nerf launchers may not be used. Any hit from a paintball fired from a marker counts. This includes ricochets and bounces. You may use flashlights and spotlights. However, handheld spotlights count as your equipment and, therefore, if the light is hit the player holding it is eliminated and must take his light and leave the field. Personal property of others is to be respected at all times. This includes, but is not limited to, generators, noisemakers, perimeter warning devices, flashlights, spotlights, etc. If you come across something of this sort and need/want to disable it you must check with a judge before doing so. Items such as generators, noisemakers, or perimeter warning devices you wish to take on the field must be approved by Viper before doing so.